Google Docs is a freeware web-based office suite offered by Google within its Google Drive service. It also was a storage service but has since been replaced by Drive. It allows users to create and edit documents online while collaborating with other users live. 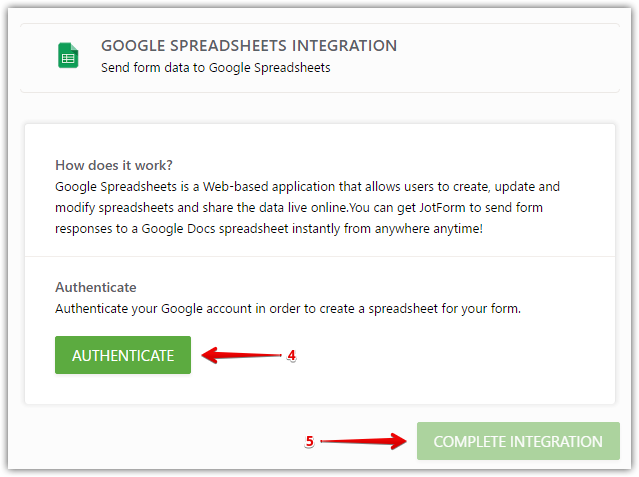 Setting up an integration with Google Docs for your forms is quick and easy. Please follow the steps below! 4. Login to your Google Account and continue the steps to complete the integration. 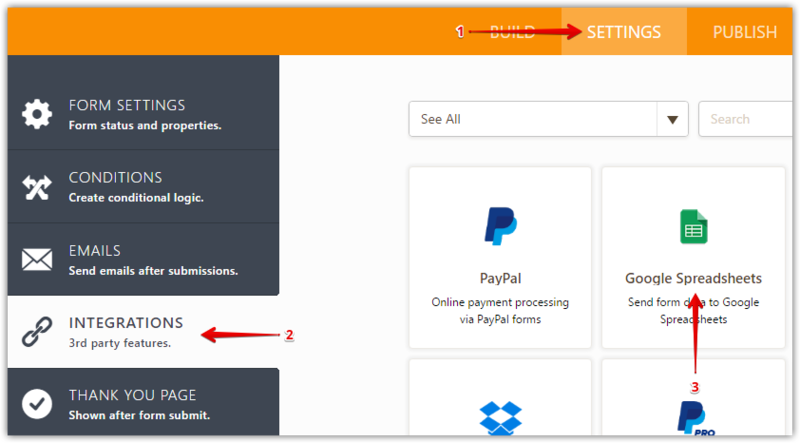 When you receive submissions on your form, they will be instantly pushed to the provided folder path. Give it a try today and let us know if you have any comments, questions or suggestions. By experimenting, I think I've learned the following, all of which it would be great if you could add to this user guide. 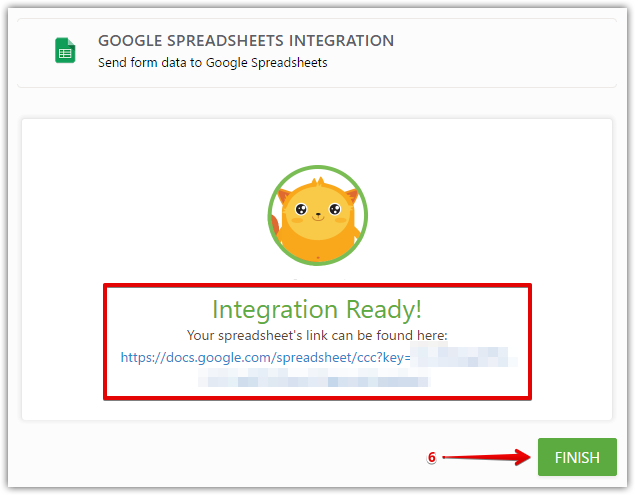 - When you create a Google Sheets integration, JotForm will try to find the folder name you give it wherever it may exist in your Google Drive account, even if it is a subfolder, a sub-subfolder, etc. This can cause unexpected results, so be careful! - If Jotform can't find a folder (or subfolder, sub-subfolder, etc.) with the folder name you specify, it will create a folder with that name as a folder in your My Drive folder. - When you give JotForm a name for the sheet to contain the form's submissions, it does NOT search for a sheet with that name. Rather, it CREATES A NEW SHEET (in the folder you specified) and assigns the name to that new sheet. - The integration between form and sheet is based entirely on the unique URL of the new "integrated" sheet. That means you can move the integrated sheet to a different folder and your form will still find it (because its URL doesn't change when you move it). You can rename the sheet, and your form will still find it. You can create a new sheet with the same name you gave the integrated sheet, but the form will NOT pay any attention to the new sheet ... it will still look for the integrated sheet based on its unique URL. - You can even Remove the integrated sheet (which just moves it to Google Drive's Trash folder), and your form will still find it and update it with new submissions. - Only if you move the integrated sheet to the Google Drive Trash folder and then find it there and click "Delete Forever" will its unique URL cease to exist. Once you do that, all subsequent form submissions will simply not be sent to a Google sheet (and there will be no error message). If you edit your form, go to Settings, go to Integrations, go to Google Sheets, it will say your Google Sheets integration is up and running, but if you click on the unique URL that JotForm displays, you'll get an error message from Google saying, "Sorry, the file you have requested has been deleted." To fix the problem, you'll have to Remove Integration and create a new Google Sheets integration for your form. This document needs to describe the integration step where you pick a folder and a spreadsheet name. It needs to explain what happens if you specify the name of a folder or a sub-folder that already exists, and what happens if you specify the name of a sheet that already exists in the folder (or sub-folder) that you named. That would be very helpful, and hopefully would cut down on the questions you have to answer! Why Cant I import using my spreadsheet? When I do this is creates a new Form to be sent to the Google Doc. I already have a Form that I would like to begin sending the incoming submissions to Google Doc. How do I do that? The integration included the most recent submissions 2017/2018. I'd like to know how to include all submissions I've received since I started. Hi, I have set this up and it's great. My form requests documents (pdf) and they appear as a link in the spreadsheet cell in the drive account (wonderful). To open the document from the link you're asked to download the document. I'm wondering if there is a way to view the document in the browser (considering it has a pdf view url)? Yes. I had and saw the information in Jotform but it is not pushing forward to the Google Sheet. The data is not pushed to the google sheet. Yesterday it was fine. Today nothing. What is wrong? How can i save those data on a file of table format? I have a JotForm that I already did a Google Sheets integration with. When I change the Header name, then do a report, the old Header is still there, the link did not pull-in the new name. I have a few forms but need to combine answers in one excel doc with separated it in list of the doc. So what i need to do? I don't see any information about that. for an unknown reason, my spreadsheet only contains 21 entries now, instead of 340. So my question is: when I unlink the Google spreadsheet, and re-link a new one, will all the former entries re-integrate in the new one? Or will only new entries appear? Can we connect (integrate) to existing spreadsheet I want to pick? I have created a form to collect data. I have set the 'Encrypt Form Data - Encrypt your form responses to store sensitive data securely' option in the settings. Also, I have linked the data to Google sheet. All the data stored in Google sheet are in encrypted format. How to get the decrypted data in Google sheet. I had two users submit their forms to me, about 45 minutes apart. One integrated into my Google spreadsheet but the other didn't. Any thoughts on why? Also, for the form that didn't integrate (it was the first of the two to be received) is there a way I can integrate it after the fact without having to do it manually? Can I integrate only a few chosen fields into a google spreadsheet? Is it possible to do the integration with a readily available Google sheet instead of creating a new one? Because I have a template of Google Sheet with formulas in them and I just need the data from the form. Also, why isn't one of the question updating inside the integrated sheet? I am no longer getting updates on my google sheet from the JotForm. How can I confirm if the integration is broken and how do I fix it if it is broken? If I set up integration for Google Drive and Google Sheet under an account which is then removed from write access under Share settings, will that break the integration? I think that's happened to me. The idea was, I built a form for a team that used both a tracking sheet and submissions folder, but once the form was published I am not supposed to have access to the submissions data. How can I accomplish that? In this particular case I can see the folder link under integrations, but if I try to open the link it opens nothing. Is it possible to have the spreadsheet identify when there has been an edit to an entry? As far as I see while testing, the information gets updated but there is no indication what/when/if it was changed. I would rather have the submission date change to the most recent edit date, or add an "edit date" column. Best excel table to integrate ever. from where could this bug come from ? Will each new submission be added as a new line in the worksheet, or as a new file? Is there any way to specify the folder on Google Drive that the form puts the Sheet? it seems to connect to a personal account but is the only way to share that in a folder is to change the shared settings? it would be great to have a navigation option to pick a folder on the same org's drive. After editing the spreadsheet (just changing the name for a column) it no longer updates with new submissions. Is there a way I can change column names/delete specific response data without it dying? Will it still work if I rearrange the columns on the Google sheet? Or if I hide any columns? Can I fetch data from Google spreadsheet based on a filter or condition , and display that data to the customer on the form. For example - when a customer enter his email , suppose xyz, then that particular email id will be checked in the spreadsheet and all the occurrence of that email id will be displayed to the customer on the form. I just created an integration from a form with 1.800 records but I only got the first 500. After 501 only date appears. not working :( i cant see the data after i have set up the integration with google spreadsheet, Can someone help me. When I try to integrate an existing form with google spreadsheets, it results in an empty file. Could you please help with this! is it possible to delete rows from a google spreadsheet using data from a specific column response in google forms. I want the responses to delete rows in a column called address in my google sheets. Is there a way to connect a form to a private google sheet owned by the person filling in the form? Each time the form would be filled, another row would be added to the sheet. Then somebody else filling in the same form could connect the form answers to his private google sheet. I have several forms for one project. I would like to keep all the data within one spreadsheet but on different sheets within that spreadsheet. Is this possible? We are getting all data in google sheet only submission date is not coming from last 7-8 days, when I look into the Jotform excel sheet , submission date is visible, but in google sheet it is not visible. Earlier it was coming fine. Could you pl guide us. Earlier it was coming finr. I am using the spreadsheet created by jotform. Then I need another google form to the same spreadsheet BUT IN OTHER TAB. I HAVE THE PROBLEM THAT NOW THE ANSWERS FROM THE JOTFORM FORM AND FROM GOOGLE FORM GO TO THE SAME TAB MIXING EVERYTHING UP!! Anybody can help me on this???? Is there any way I can have responses pushed onto the sheet without the responses sheet being the first one on the document? Everything worked fine for my spreadsheet until I moved the tab with the responses on to the 2nd. It begins working again every time it's in front, however this isn't optimal since the 'Main' page is now second and the responses are part of something larger. I am with the same problem: the integration just does not work after a few days. I tryed to do another integration, but the problem persists. Is it possible to choose which fields are integrated into google sheets? Basically my form will have around 500 fields and when mapped to google sheets the submissions will quickly eat up their 2 million cell quota. I completed all the steps as indicated above and my google sheets receive NO DATA. I've spent over 3 hours on this. I am looking for another form solution. Anyone have one? Is it impossible to change the spreadsheet formatting/colors with this integration? Whenever a new report comes it it gets changed. I'm also all of a sudden having trouble with Sheets integration. It's been reliable up to this point and that's definitely what we need it to be: reliable! Why Checkbox fields don't show up in excel spreadsheet?